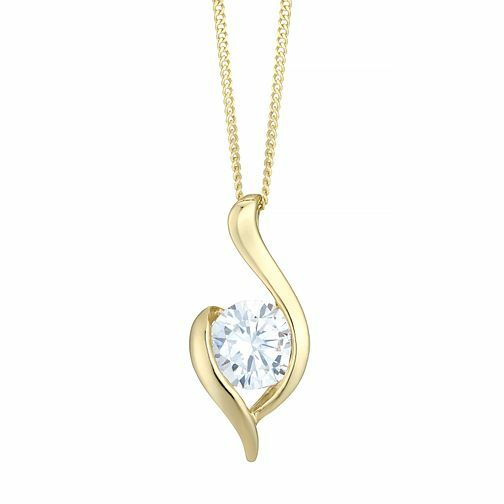 Go for effortless chic with a healthy dose of sparkle, with this elegant and versatile 9ct gold pendant styled in a flowing design. Finished with a fine chain for a feminine feel. 9ct Gold Cubic Zirconia Set Pendant is rated 3.0 out of 5 by 4. Rated 1 out of 5 by Anonymous from too fine and small chain is too fine and pendant smaller than expected. But seems to be a reasonable quality, but just concerned that the chain will break too easily. Rated 5 out of 5 by Anonymous from My mom was a gift. The pendant is perfect. The chain could be slightly thicker.